Kataru's love and pursuit of Farming: PureSense makes sense! Farming is not easy, not pretty, not wildly profitable. And I had no prior experience; then, why did I even get into it? I believe I felt a connection. Plus the challenge excited me - To be a successful farmer nowadays, one has to be equal parts entrepreneur and agronomist. As I dug into it, I also found farming to be fulfilling. That's how I branched into agriculture, as the Sanskrit aphorism "Vriksho Rakshati Rakshitaha" (Trees, when protected, protect you) took on a new meaning for me. A year ago, we installed PureSense real-time irrigation monitoring system on Carpenter ranch. 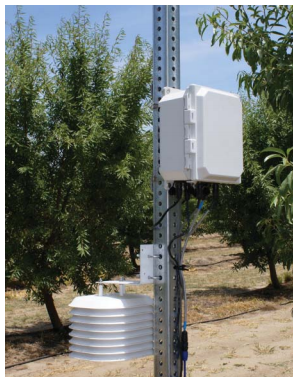 PureSense people installed a field station that periodically records above and below ground conditions and sends it off to a server which can be accessed online real-time. Q. How does it measure below ground conditions? A. By constantly communicating to a number of "soil moisture capacitance sensors" buried in the ground all throughout the orchard. Q. How does a "capacitance sensor" measure soil moisture? A. The sensor is basically an electronic circuit in which two plates use the soil between them as dielectric of a capacitor. In simpler terms, depending on amount of water present in the soil, its electricity conducting properties change. 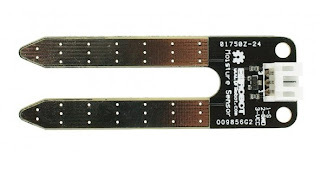 Just to give you an idea, here's what a very simple soil moisture sensor looks like (this one is Arduino one -- the one where you can program for your home plants. Puresense one is much bigger). Q. Do we have any complaints? One big one. Their software only works on Windows and Internet Explorer. We can login to the server and check up on soil moisture levels on all blocks so we can identify problem areas within the orchard which need extra attention in terms of irrigation. It also records and builds a database of irrigation data particular to our orchard which we can analyze later for historical trends. For instance, when we apply fertilizers via irrigation system, it can record the amount of fertilizer we applied and such. So far we are happy with it. To learn more, go to http://www.puresense.com/ . This is how the field monitoring station looks like. Wood colony is neither wood nor colony. Shaking Wood Colony. Mostly shaking well. ©Naga Kataru. Watermark theme. Powered by Blogger.